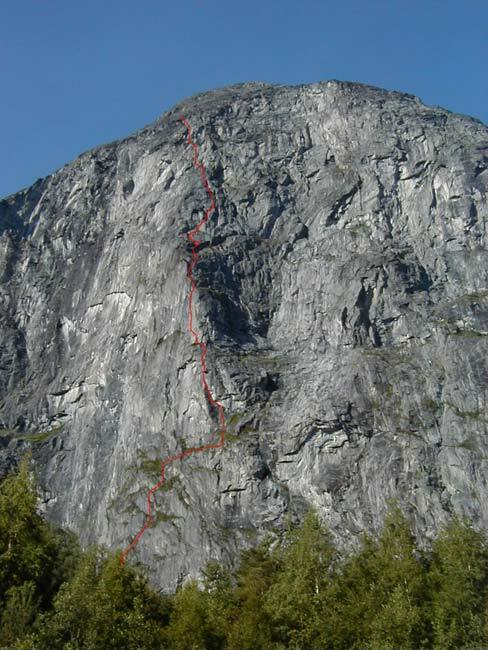 The south face with South Pillar Route marked. First ascent: June 1981 by Hans Christian Doseth, Anders Lundahl. 900 m, 24 pitches, 10-20 hours for a rope of two. The photo shows the wall very foreshortened. As my own shot was taken early morning and too dim this nice picture is kindly provided by Anders Flaarønning from his website www.anders.ws. Thanks to Anders. The line is mine, though.